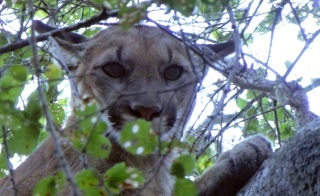 File image of mountain lion P-23, photo provided by the National Park Service. An aggressive mountain lion was spotted early Tuesday in an unincorporated area of San Mateo County. The animal was spotted in the 500 block of Pescadero Creek Road at about 4:30 a.m. The mountain lion has killed many small livestock animals in a resident's backyard, according to county officials. The animal approached the back door of the resident's home and was not intimidated by two pit bull dogs, county officials said.